consciousness | S.B.K. Burns' Sci-Fi Romance . . . . . . . . . Science & Spirit . . . . . . . . . . . . . . . . . . . . . Heroines with Attitude. . . . . . . . . . . . . . . . Heroes with Heart . . . . . . . . . . . . . . . . . . . Fly Like An Eagle just out today and it’s already in Amazon’s top 100 for STEAMPUNK. A coming of age for tomboy Samantha, as she flies with Eagle across an American river valley in his hang glider–to avoid betrothal to his father. Meet Ben Franklin, H.G.Wells, and Amelia Earhart with a little romance thrown in. SPOILER ALERT! If you haven’t seen the movie Arrival yet, skip this post until you have. This is about the movie Arrival that I saw on Friday, November 11, 2016. An unmarried linguist who lectures at a college has written a book with a new idea about language and how it influences society. She falls asleep and dreams of her life as a mother of a most wonderful daughter who tragically dies of a rare disease. The aliens land at twelve sites that are not remarkable and have no relationship to one another. She is picked up by the government to be a member of a new team to communicate with the aliens’ vessel in Montana. The aliens appear to be like cephalopods with articulated tentacles and starfish-like hands at the end of each that squirt out ink that they can force mentally into circular hieroglyphs. The profound discovery she makes is that the circles contain, along their perimeters, shapes, each of them representing a word. When all words are taken together they only create meaning when their sentence does not exist in static time. So this is a secret to the way the creatures speak and maybe think. All countries are working on communicating with the aliens, but they’re all afraid of each other, so they cut off contact. The linguist discovers that all twelve alien landing sites are communicating a different piece of the communication puzzle. In the end, she goes in by herself to speak with the aliens and discovers that their way of looking at things, their consciousness is not linear, but like their writing involves sets of words, ideas, happenings that occur in what I set out in my Union of Opposites website as snippets, or clips of experiences, dreamlike. She now realizes she can see now see ever more clearly into the future and this seems to bring a closure to her life. One of the last images is something the aliens left for her, a book she’s written about their language and intent. But the view she has involves a special celebration, a formal affair, thrown by the Chinese head-of-state who tells her he had to meet her. She was the reason the Chinese got the rest of the world to share their information about the aliens, their language, and their message. She asks him how this came about—how he knew to trust her when she called him on the phone? The scene goes back and forth, ending with the physicist in charge putting his body between her and the US soldiers aiming at her. Unbelievably she’s on the phone with the head-of-state, but still doesn’t know how she’ll reach him, so he’ll believe her about putting every country’s message together. He whispers to her that the first words from her mouth in Chinese are the last words his wife said to him before she died. Somehow we see the two become spirits under the skin. Back in time, she relays the message and tells the general the truth that leads to the future. The future involves a gift, her book, setting out and explaining the aliens’ language. She still had her life. It would cycle through a marriage to the lead physicist who had saved her life. They would have a child. A wonderful daughter, who would die of a rare disease. Her husband left her when she told him, because of the aliens’ gift of second sight she knew their baby would come down with the disease. So she and the daughter had to face their time alone. But this time more than her simple humanity was involved in the story of their lives. And one only guesses that this time her husband, the father of her child, the physicist, will stay till the end. Or was her initial dream prophetic? I say the ending might be different from how she’d imaged it in the beginning, there are two wine glasses on the table in her home. A new beginning or a stage set error? I believe the story’s left open-ended, or am I just an incurable romantic? Well, it looks like I need to work on the depth in my writing skills, and/or keep closer to the formulas readers desire (at least, according my requesting editors and agents). I have, at present, three novels I intend to indie-publish before the end of the year–a chance to promote all three while I put them on pre-order with Amazon. Two of the novels are from a new genre (similar to The da Vinci Code, historical sci-fis, or non-formulaic steampunk), a series I call Ages of Invention. The two novels from Ages of Invention are Entangled (the image above) and Fly Like An Eagle. Both are also time travels. The third novel is my only contemporary romance, Open Season, about tennis at the U.S. Open Tennis Championships. I can’t wait to work with the artist on this cover. At present my WIPs are a full-length sci-fi space opera thriller titled Flat Spin and two sci-fi novellas titled Too Pretty and Other. Please go to my Facebook page, SBK Burns, where I’ll be posting sci-fi and horror short stories and excerpts from my novels. Also, if you’re a geek like me and want to read nonfiction ideas about my experiment (an analog of our expanding universe) or philosophies on consciousness, life, and death, please visit my Union of Opposites website. Though I find myself hanging in there with the housework, even though I have loads of writing and editing to do everyday, I’d rather get my readers interested in how my writing life is going–what I’m learning–than talking about household organization, no matter how important that is. Right now, I’m hoping I hear something from the agents and editors I pitched to at RWA Nationals, that is, before I self-publish the two novels in my Ages of Invention Series. Have all the covers for the two novels ready to go. I just need to start handing out advanced reader copies for review. And I’m anxious to finish my WIP space opera, to get to working on a young adult science fiction novella. I’ve never enjoyed history more than that in the novels of my critique partners, and because of my background in science, I’d like to learn as much as I can about the way people thought about science throughout history. That’s what led to the writing of my historical science fictions. The Union of Opposites website (theunionofopposites.com) explores different kinds of consciousness that I use in my stories. The site is philosophical and built on my published experiments, but it helps me create a new world of thought for my future novels. That’s all for now. I’ll keep you posted. 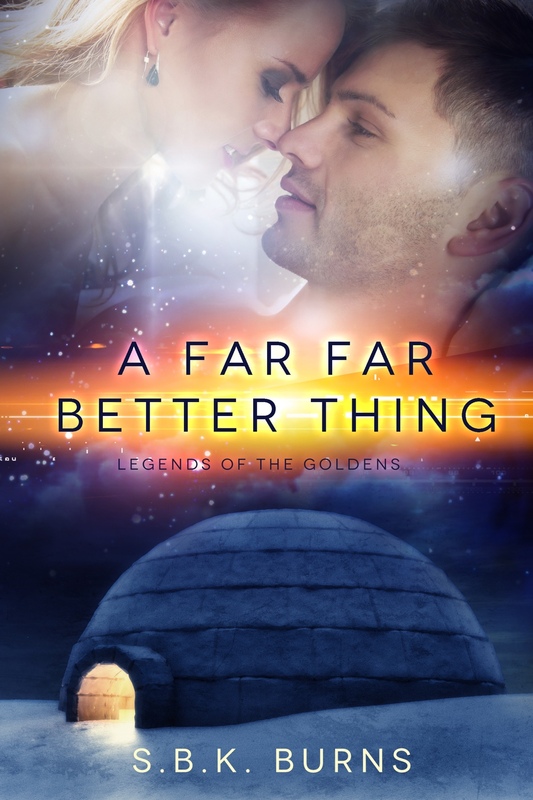 A FAR FAR BETTER THING prequel novella to the offbeat and quirky LEGENDS OF THE GOLDENS SERIES of sci-fi, paranormal psychic romances continues to be downloaded and in Amazon’s Best Seller Ranking for several months. FREE: Please download this introduction to the series where the first Golden/human hybrid, Chastity, is naturally born and creates havoc within the Golden community. My new Adult Sci-fi Romance Newsletter is out. Recipients asked Amazon to price-match to Barnes & Noble’s Nook and Far Far just posted for free. So now my newly released prequel novella to the Legends of The Goldens Series is free on nook and kindle formats. To keep up with my new releases, works in progress, prizes, and special deals, subscribe to my newsletter by clicking on the rectangular image of the lovers in the upper RHC of this website. Can a girl fall for someone who isn’t her equal, who isn’t even human, just an attractive copy of one? Or is he? It’s hard for Kira to resent or resist Max, when all he wants to do is keep her safe, when he’s willing to give his life in order to save hers. Book One in the Legend of the Goldens Series: Forbidden Playground is now out in paperback.